I met my mentor in the middle of a hostage crisis. As a SWAT team swarmed a ratty house in a forgotten field, I chatted up a colleague who would become a valuable mentor and, decades later, one of my closest friends. Twenty years ago, she was a seasoned reporter for the state’s largest newspaper, and I was fresh from college, working as an over-eager, under-prepared reporter for a small town newspaper. It didn’t seem right to chat and giggle in the middle of a gun-toting, armor-inducing situation, but it was a welcome relief to find an ally in the midst of this backwoods kind of crazy. Aside from asking questions and taking notes, I didn’t know much. But I knew enough to keep my mouth shut and my eyes open. She’d worked for both small and large papers. She was smart and opinionated. She told stories of grouchy editors and wacky sources. She found life disgusting and delightful, in equal measure, and I aspired to be her. Over the years, she nudged me toward better jobs and opportunities, and we grew into ourselves and our careers. In our own time, we each moved away from newspapers and into other media and marketing worlds. We shifted from mentor to colleagues to, ultimately, friends. I've now known my mentor for half my life. And we now show ourselves more fully, not just the professional parts but our personal success and struggle too. We laugh a lot. We read newspapers and grumble. We drink martinis (which she taught me to enjoy: Bombay Saphire, shaken, hint of vermouth, three olives). We sigh. Years ago when I stood in that field waiting for a man to come to his senses I had no idea I was meeting a person who would mark my life, and my heart. Recently, I spent time with a young woman I met over a decade ago, when she was a high school student and I was a volunteer for a teen writing group. We’ve kept in touch over the years, through her first job, her first (and second) apartment, her marriage, her move out of state. We’ve shared poems, letters and life-changing decisions. When we met for lunch, we hadn’t seen each other in several years. And yet we started just where we had left, chatting about books, art, clothes, love . . . I saw that she moved with more poise and spoke with greater assurance. She had grown into herself. This is how it feels, I thought, to witness a person becoming. 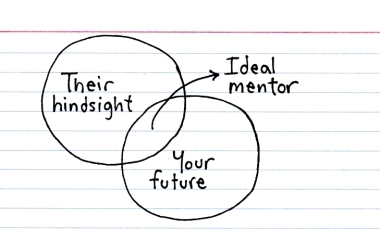 Wistful and proud, I was standing now on both sides of mentorship, grateful. It's Thankful Thursday (on Friday), a weekly pause to express gratitude for people, places, things and more. Our joy contracts and expands in direct relation to our thankfulness. What are you thankful for today?